At a minimum, it is recommended that students have reviewed and understand the information presented in the K.O.I. 101 course, available free on this web site to Registered Users. This is an advanced-level course, and will require some math skills. 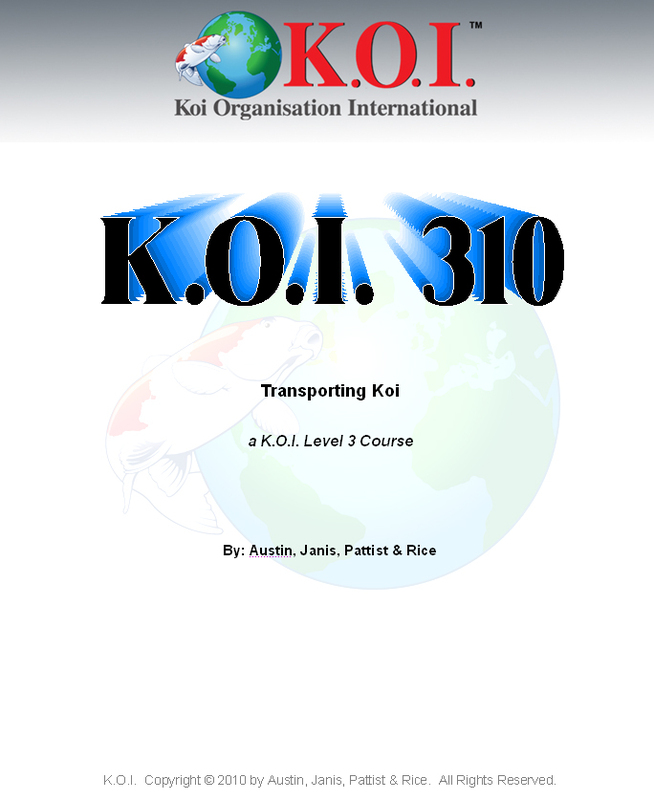 The reading assignment for this course is a paper entitled Transporting Koi, by Austin, Janice, Pattist and Rice. This is a self-paced course. There will be four exams. The exams can be taken at any time, but all must be completed within the 12 months allowed for the course. Email a request for the exam at any time to Ken Austin at kraftz@swbell.net . Have some fun with this. Learning about Koi health can be challenging, so the instructor encourages each student to both learn and enjoy the course. Everyone that works hard is expected to complete the course. To complete this course, students must provide satisfactory answers on all exams within 12 months of the first instructor contact.